Selection and design of a planting area for raspberries is one of the most important steps in producing a healthy crop of raspberry canes. The area should not be shaded by large buildingsor trees, or be in a low-lying area that holds excess water in the soil. Do not choose an area that has grown tomatoes, peppers or potatoes in the previous four years; these plants carry the Verticillium fungus that causes root rot in raspberries. Wild raspberry plants should be destroyed if they are growing within 600 feet of the planting area as they carry viruses that can spread. Select a planting area that has a well-draining, acidic soil and full sunlight. Remove all vegetative growth, rocks and weeds from the area. Work 2 to 3 inches of organic compost into the soil with a tiller to a depth of 10 to 12 inches. Test the soil pH with a home test kit to verify it is 5.5 to 6.5. If necessary, work ground rock sulfur into the soil to lower the pH number. Water the soil well after amending to assist with absorption. Create rows, called hedge rows, for planting the raspberry canes. The growing area should allow room to plant the canes 2 feet apart in rows that are 8 feet apart. 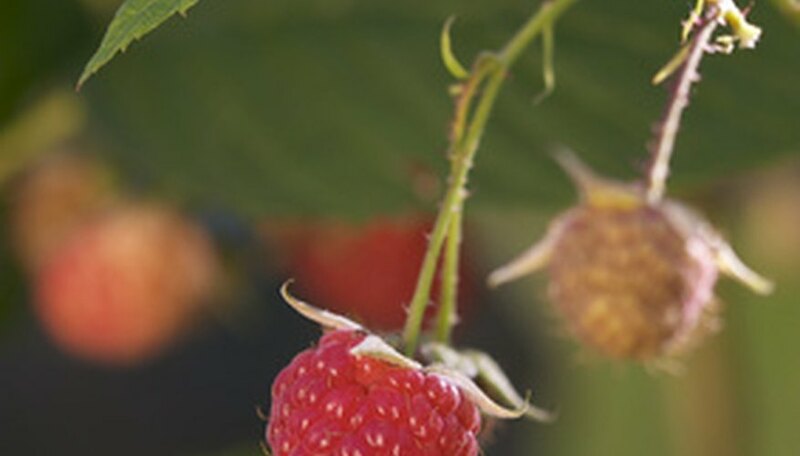 Build a wire support trellis along each row for tall-growing raspberry varieties. Place support stakes every 4 feet in the row and string three rows of wire evenly on the poles, with the top wire being 4-1/2 to 6 feet in height. Tall varieties will arc over the top of the wire to hold themselves in place. Prune dead and damaged raspberry canes during the winter or early spring dormant season. Cut off approximately 3 inches from the tips of all canes that produced fruit the previous season. Remove canes growing between the rows and along the outside of narrow rows. Canes growing between plants inside the rows can be kept. Keep the rows narrow to prevent shading, which promotes disease.